Each time you perform an abdominal crunch, you are flexing your spine forcefully and repeatedly, which causes it more stress than it is designed to handle. Over time, it puts excessive strain on the part of the lower back that has the most nerves, leading to its wear and tear. In fact, sit-ups or crunches only focus on toning the rectus abdominis muscle, a pair of flat, long muscles that run the length of your abdomen, and neglect working your core muscles. These comprise the deep muscles in your back, abdomen and pelvis – what you rely on for daily living as well as sports and recreational activities. To more effectively strengthen your abdomen and avoid back pain, try these exercises for a good core workout. Hold the medicine ball overhead, then slam it into the ground as hard as you can, while keeping your abs tight and breathing out. When you exercise your abs, you also need to maintain your low back strength. You can do a low back strengthening bridge by lying on your back, then pushing your hips up towards the sky while keeping your feet flat on the ground. Get into a belly-down position with your elbows bent and your body supported by just your forearms and your toes. From here, you can simply hold this plank position, or you can tap your feet or alternate between reaching with each arm. In a standing position, hold a dumbbell, medicine ball, elastic band or cable above your body and to the side of your shoulder, and diagonally rotate with extended arms from above your shoulder, down and across your body to the outside of your hips -- just as if you were holding an axe and chopping a block of wood. In a standing position with your feet firmly planted and knees slightly bent, hold a cable or elastic band at arm's length (keep your arms straight) and twist your body. "Another way of activating the core would be to do stability exercises, as anything that challenges one’s balance would activate the deep core muscles." - Wendy Cho, Fitness Development Manager at True Fitness. Wendy has been in the fitness industry for over 12 years and has numerous fitness and personal training credentials from FISAF (Federation of International Sports, Aerobics and Fitness Inc), AFPA (American Fitness Professionals and Associates) and IKF (International Kickboxing Federation). Besides her extensive experience in weight, endurance, strength, rehabilitation and core training, her naturally vivacious personality and ability to connect with people is undoubtedly another asset which contributes to her success in this industry. 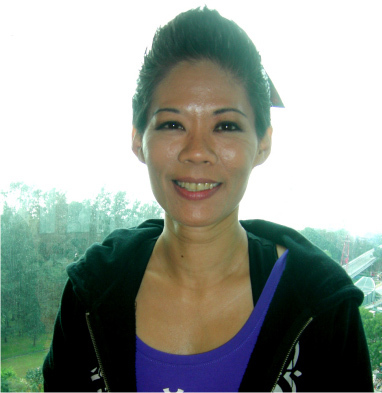 In her capacity as Master Trainer of True Fitness Singapore, Wendy plays a pivotal role in creating and introducing new forms of training programmes.